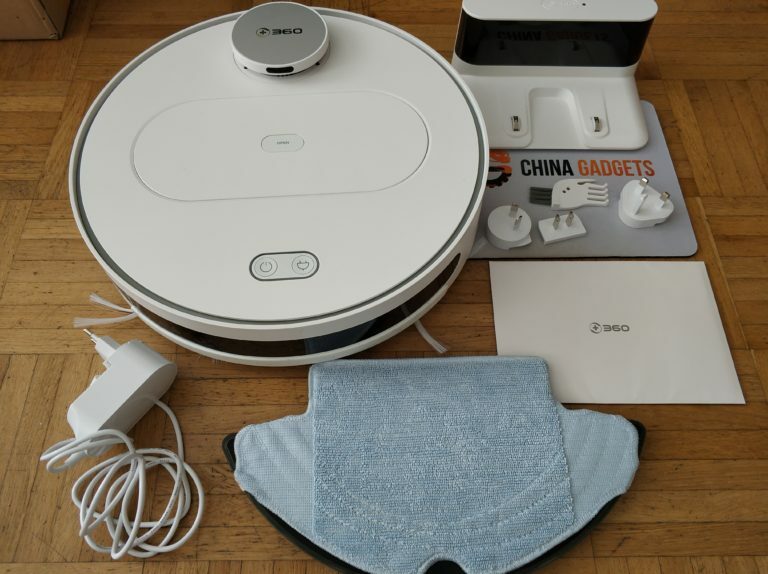 Xiaomi has dominated the vacuum robot market for quite some time and the two top models of the Chinese tech giant, the Mi Robot and the RoboRock Sweep One, are responsible for this. The manufacturer 360 Mobiles has made a name for itself in China over the last few years with budget smartphones and wants to shake the Xiaomi monopoly. With the 360 S6 Sweeping Robot the chances are not too bad. We have tested it. You don’t have to worry about obstacles like this with the S6, but something about the volume. The delivery includes everything you need, but nothing more. Design and workmanship of the 360 S6: A Xiaowa with a dome? 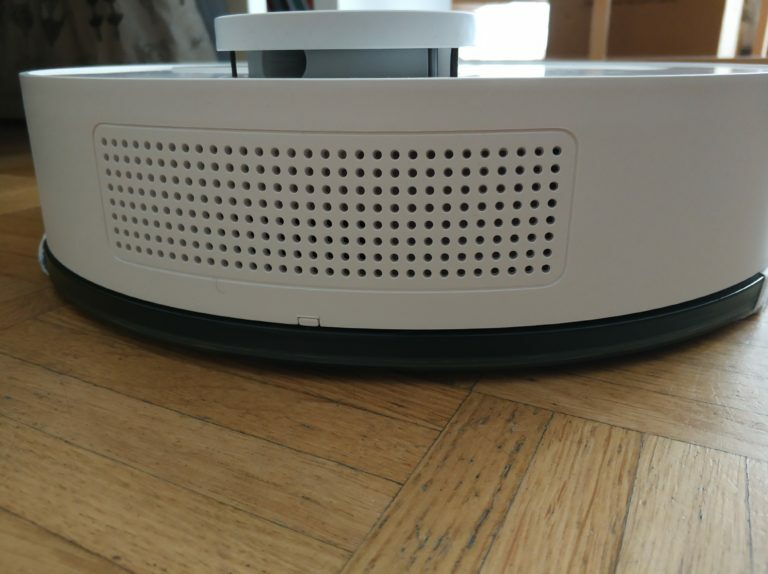 Visually, the vacuum robot looks as if the new Xiaomi Xiaowa had a dome on its top. We know this dome from the two Xiaomi vacuum cleaners, where the laser distance sensor is located, over which the robot measures the premises. 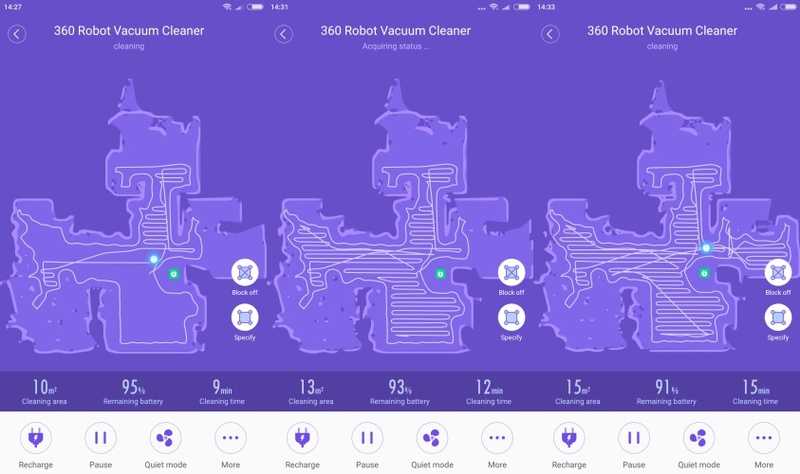 The 360 S6 Sweeping Robot creates a map of the four walls on it, which can be displayed in the app. More about this later. The LD sensor on the top side is optically and technically very successful. 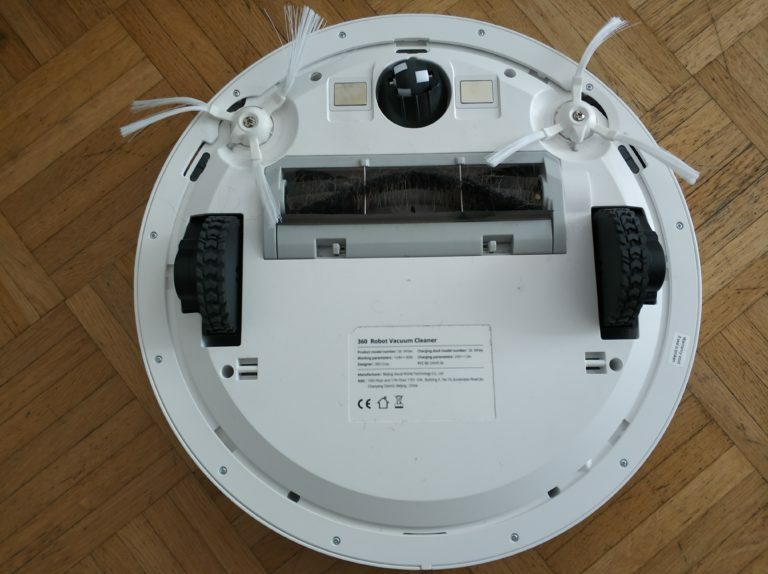 With dimensions of 35 x 35 x 10 cm, the vacuum robot is quite high due to its top-mounted dome, which must be clarified before purchase. If you want to vacuum under furniture, this is definitely not possible for everyone. The weight of 3.5 kg is average, so lifting the vacuum robot by hand is not quite as heavy (but also not easy). Despite many control options at a distance, the vacuum cleaner is sometimes lifted. Does it fit under there or not? With the height of 10 cm it gets narrow every now and then. 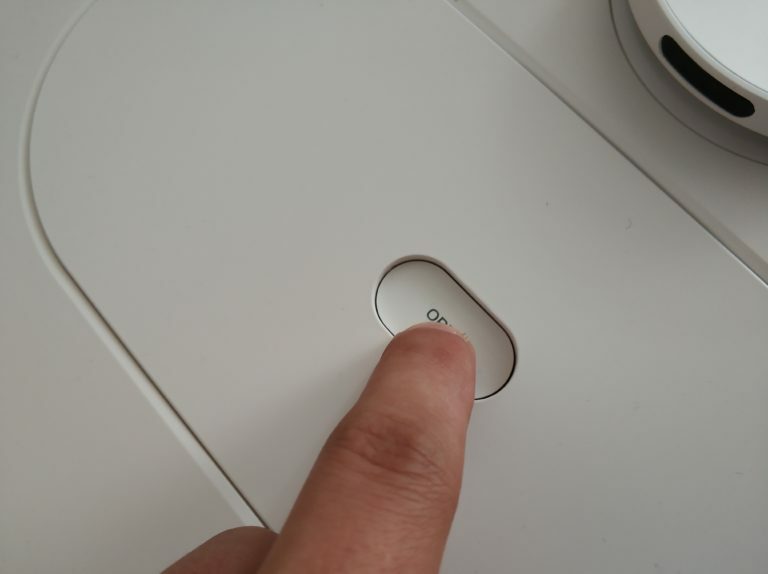 The controls on the top look exactly like those of the Xiaowa, except that the mini room work mode button is missing. 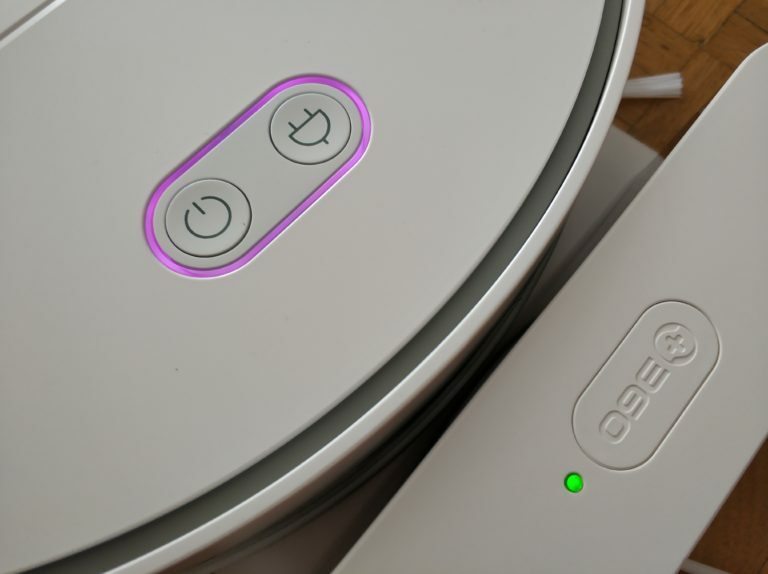 The power button starts and stops the vacuum robot (turns it on and off), the button with the charging cable symbol sends it to the charging station to charge the battery. We know them from somewhere, don’t we? Two buttons are enough for a normal use of a vacuum robot. The processing is flawless, no errors can be found anywhere. When it comes to design, Xiaomi has definitely copied something from this, but that’s not bad. After all, the Xiaomi models don’t only have so many fans because of their functionality. 😉 As the first product of this kind from the manufacturer, they also don’t try to reinvent the wheel. A CE mark can also be found on the underside of the robots. 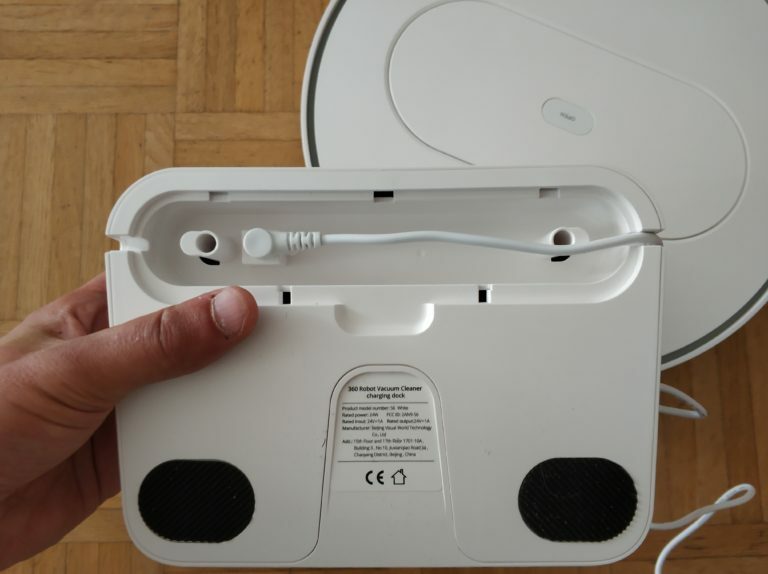 On the underside there are two brush heads instead of one like the Xiaomi robots. In summary, the vacuum robot is not my personal favourite when it comes to design, but you can’t say that 360 Mobiles has any bad taste here either. 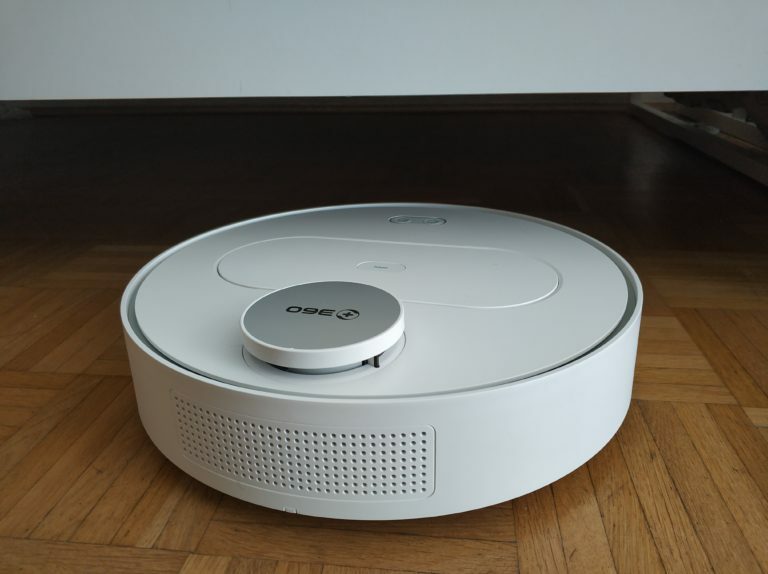 A completely flat vacuum robot like the ILIFE A6 or A7 looks a little better (but can also do less). 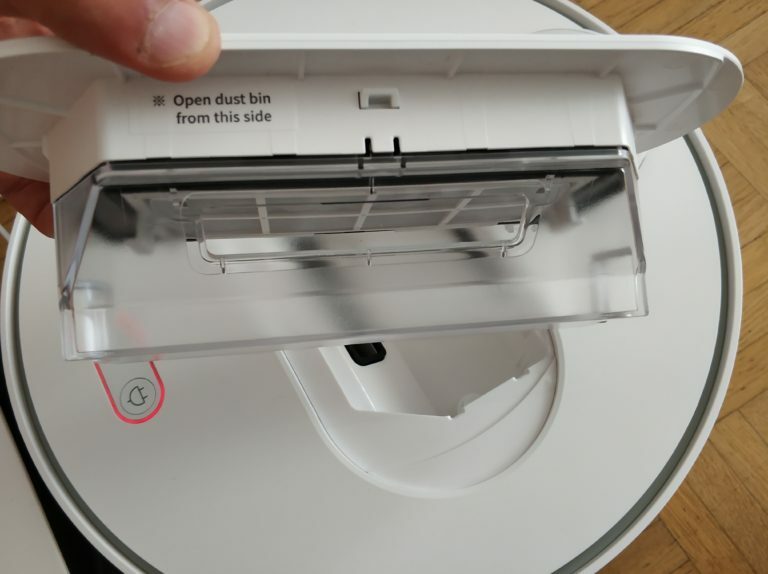 Smart: If you press the “Open” button above the dust box, it jumps up immediately. The dust chamber, which has a filling capacity of 0.4 l, can be removed and emptied in a single movement. … and we have the 0.4 l small dust chamber in our hands. The dust chamber contains a three-layer filter consisting of a primary filter, a sponge filter and a HEPA filter. Dust allergy sufferers like me are happy when they can remove and empty the chamber without after-effects. If you want to vacuum quickly, you don’t have to wait long: The charging time of 3 h is quickly bridged and very short compared to the standard 5 h of other models. Where you place the charging station in the four walls is up to you, but it helps the robot if the position does not change. From time to time the robot uses the station as an orientation point for navigation or cannot otherwise find it again. After only 3 h loading time, the vacuum robot is ready for operation. Rubber linings are provided under the station to ensure that the charging station is held securely and stable, so that the station does not slip or be pushed away when it comes into contact with the vacuum robot. A CE mark is also included here. Below the station there are small rubber surfaces which ensure a firm stand. The charging cable can be conveniently placed in the charging station so that there is less chance of cable clutter and the cable does not just lie around. These are also the small things if you want to convince all around. No more cable clutter: Simply place the cable in the station. A highlight: If the 2 h working time is not enough for the complete cleaning of the premises, the vacuum robot automatically returns to the loading station. There it recharges the battery and continues where it left off. Up to 200 m² should be possible with one battery charge, at least up to 120 m² I can confirm. 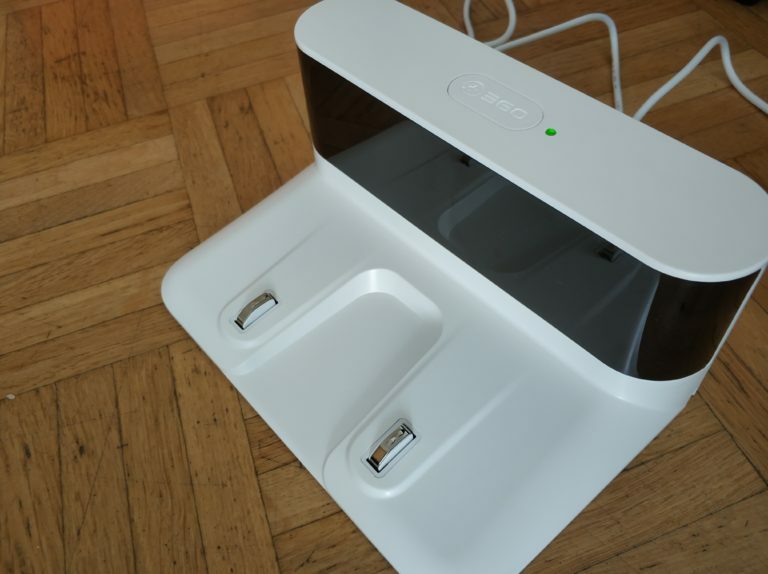 The design of the charging station is also reminiscent of Xiaomi. The cards created can also be saved and used the next time the vacuum robot is used. This means that the vacuum robot does not have to invest any additional time to re-measure the premises. This means that the vacuum cleaner can also be used on several floors with several maps. In addition, there is also the room division, with which the vacuum robot can be given on the map where it should not vacuum. More about this soon. First, the entire room is scanned and measured. Robot rotates around itself, scans the environment with LDS-LiDAR (Light Detection and Ranging). An infrared sensor and SLAM algorithm (SLAM stands for Simultaneous Localization and Mapping) create a map of the premises. The fastest route is planned and vacuumed. The SLAM technology, by the way, comes from the 360 Mobile Team, which deals with self-propelled cars and develops them. Accordingly, the manufacturer has knowledge of autonomous driving. 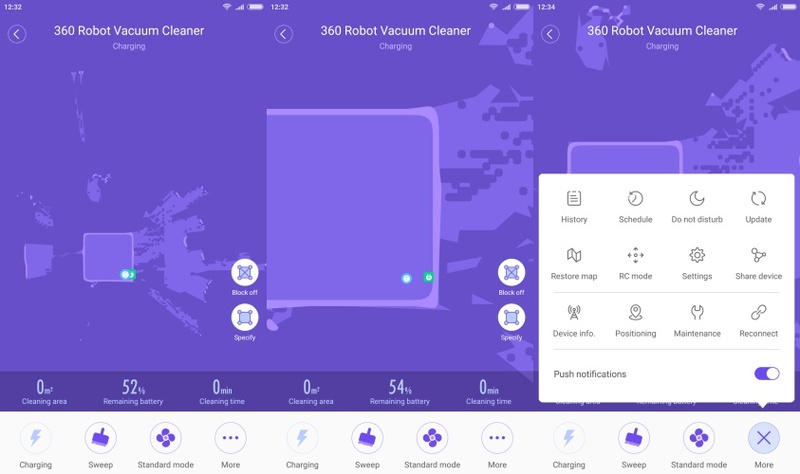 An app is like the heart of a vacuum robot with space measurement and mapping. The App 360Smart (Android, iOS) requires every conceivable access (for whatever reason) when downloading. This is no longer a rarity with apps, but it is still annoying and must be considered before buying the robot. Then comes the next, from a data protection point of view critical bang: To use the app you have to enter your mobile phone number. Then you get a verification code via SMS to your mobile phone number. Here you can at least take precautions: Since you never need the mobile phone number again after receiving this code (unless you forget your password or reinstall the app), you can also use a fake mobile phone number. There are enough providers on the internet who provide such numbers. 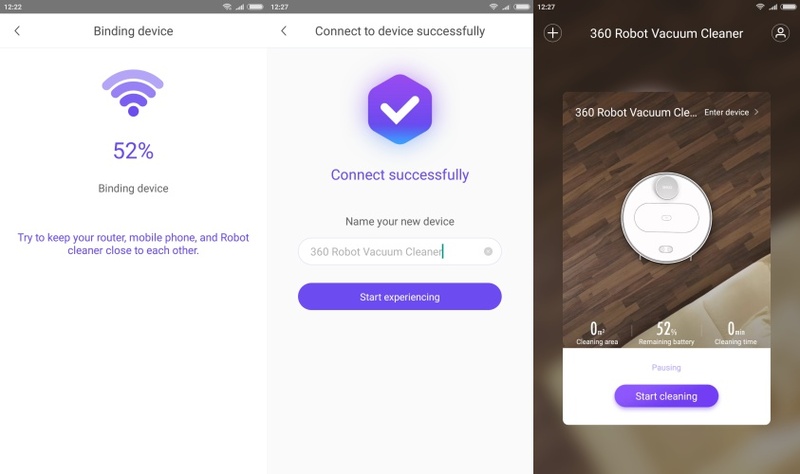 Note: For whom the app registration does not work: Simply register via the camera app of the manufacturer 360 Mobiles, then you have an account with which you can also log in to the app for the vacuum robot. 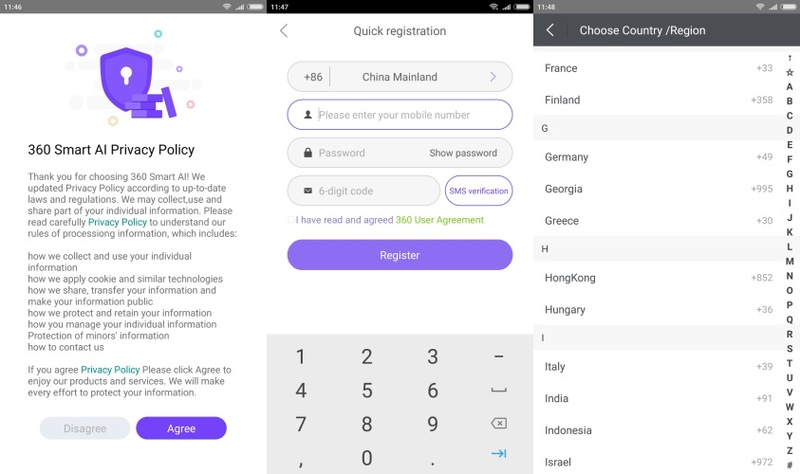 When registering in the app, a fake mobile phone number and a disposable email address are recommended. From then on it becomes more pleasant: With the Xiaomi models you often have the annoying problem that not every mainland is always available for everyone and that changes are always made. With the 360 S6 you have a huge selection of available countries in the app. Of course, long-term experience still has to show whether the update policy of 360 Mobiles is better than that of Xiaomi in the long run. Press and hold two buttons on the top for about 3 seconds. 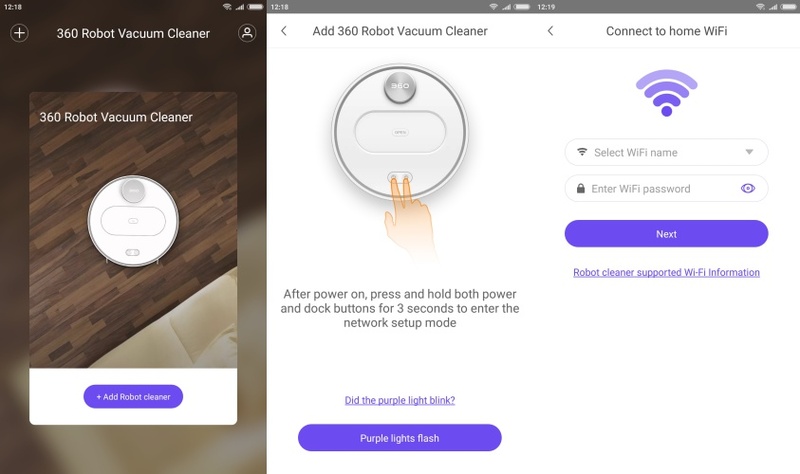 Vacuum robot announces “Reset WiFi” and LEDs light up purple. Enter WLAN with password (Important: Smartphone and robot are in the same WLAN). Robot announces “Robot starts binding”. 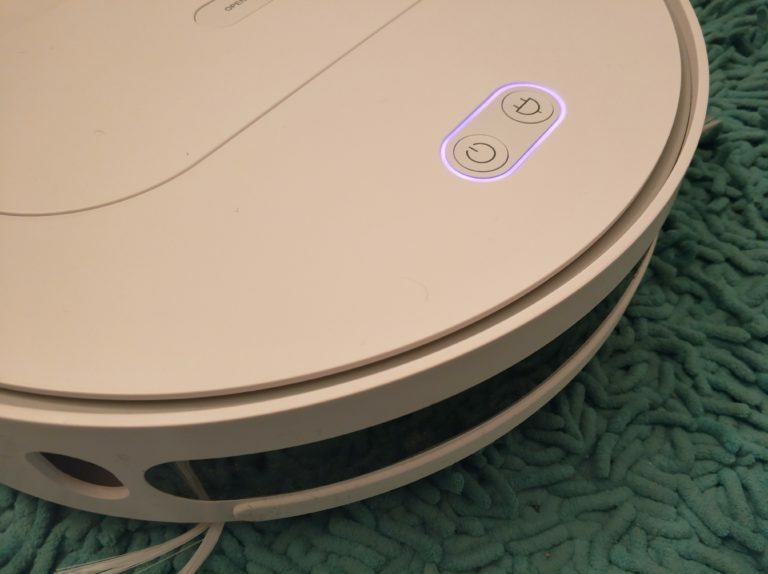 After about one minute, the vacuum robot is connected, the LEDs light up light blue after a short purple phase. The connection with the app is comparatively fast, the connection is very stable. The screen during the connection process. 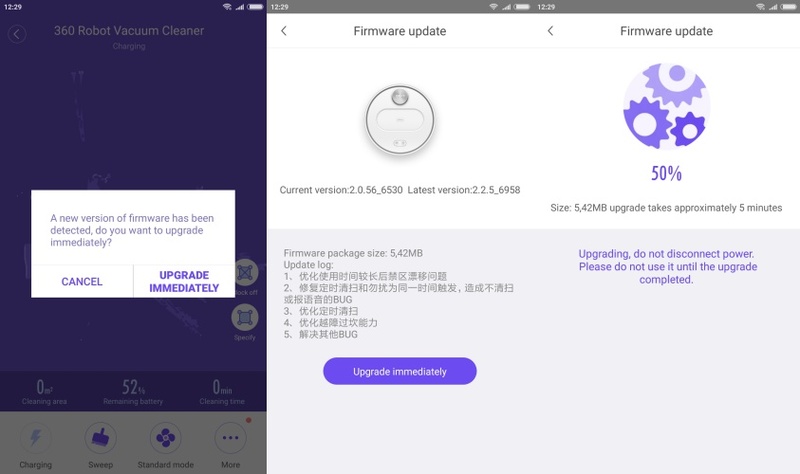 As soon as the vacuum robot is connected, the first notification for a firmware update pops up. Due to the Chinese text in the update description, it is not easy to understand what the update is about, obviously some bugs have been fixed. Due to a good update policy the RoboRock and the Mi Robot learnt the room measurement, accordingly one can be glad about firmware updates (mostly). Firmware updates can only be performed at the charging station. 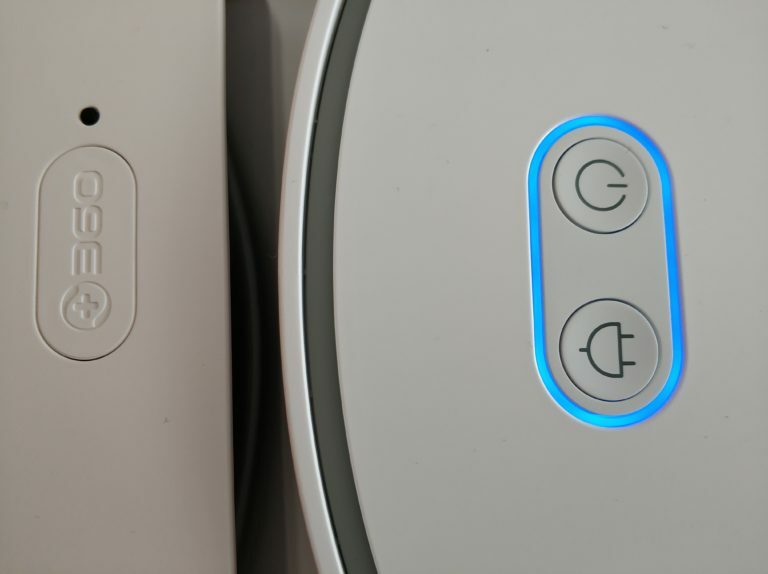 Firmware updates can only be performed at the charging station because the vacuum robot consumes a lot of battery depending on the size of the update to be downloaded. Not much can happen hanging on the station. After each update, the S6 restarts (switches off and on again). DND mode (Do Not Disturb): Set when the vacuum robot is not allowed to move. Above the not yet scanned map of the robot, below the functions and control buttons. As a user you have the feeling to be in a differently designed Mi Home App, many elements were certainly taken over here consciously – only that everything works and works here consistently cleanly. No server problems, the saving of the map works perfectly and also the scheduling of working hours is fast and simple. 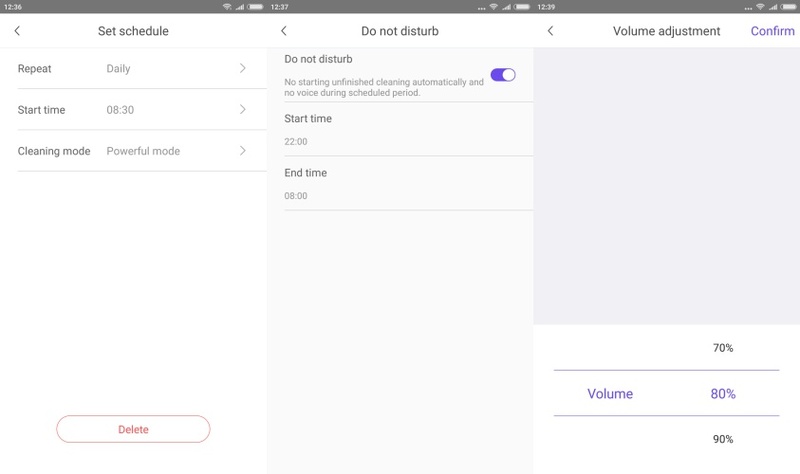 On the left you can schedule the working times, in the middle the DND mode and on the right the muting of the volume. 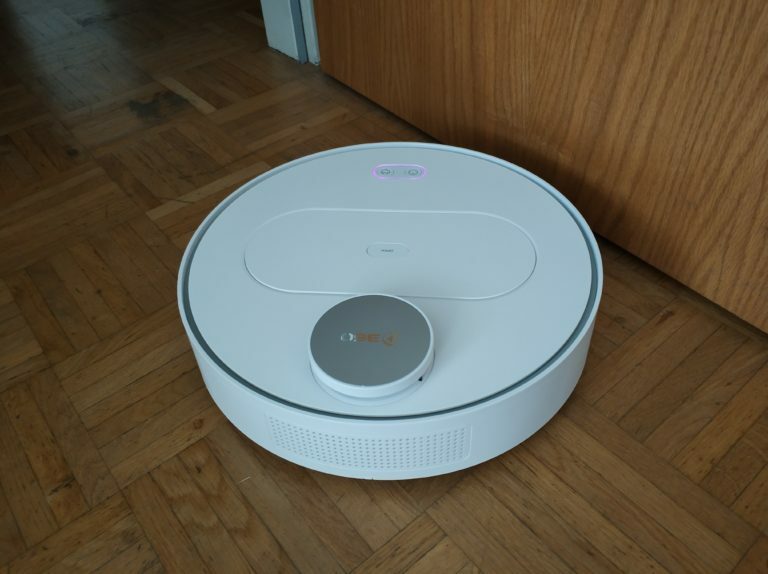 As far as working times are concerned, it is possible to choose when the vacuum robot is to perform its duty (time + weekly, daily, only during the week or on weekends) and with what suction power. On the map there is a very small symbol for the charging station and one for the robot. This live transmission of the mapping does not always work one hundred percent at the same time, and now and then the vacuum robot is already further ahead with its work than indicated on the map. It helps to return to the home screen of the app and then back to the vacuum robot. In the app there is also a remote control with which you can steer the robot exactly. The remote control works very well and fluently, also the retrieval of the charging station is done within seconds by the room measurement. The app also contains an operating manual in English. 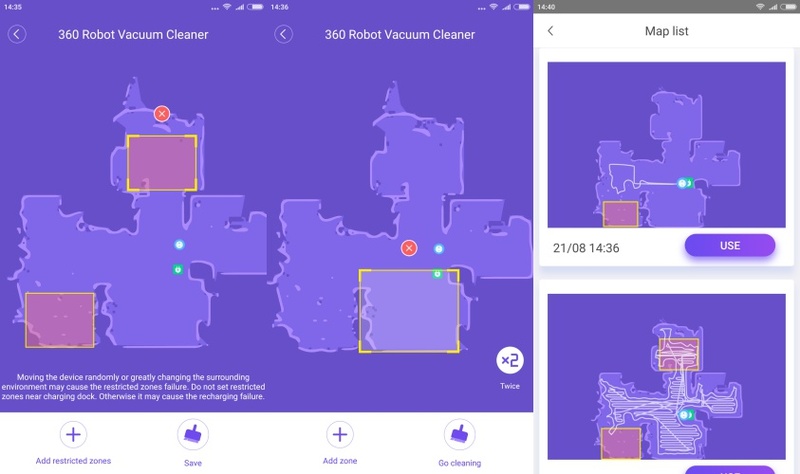 The mapping works perfectly, the vacuum robot looks for the fastest way through the four walls. Practically speaking, the robot also has a room divider, which allows it to draw areas on the map that it should avoid. On the other hand, it is also possible to explicitly define areas that the S6 then travels through individually (adjustable up to two times in a row). On the left the forbidden zones, in the middle the explicitly wanted zone and on the right the stored maps. The forbidden zones remain on the stored maps, but can also be deleted with two finger movements. This means that unwanted areas do not have to be redrawn each time the maps are sucked in. The 360 S6 is equipped with Nissan mini turbines, which can also be heard during a vacuuming process. The user can choose between three different suction levels in the app: 800 pa (silent mode), 1300 pa (normal mode) and 1800 pa (max mode). At the lowest suction level, the operating volume is only 55 dB, which makes it easy to make phone calls or watch TV. With the maximum suction power this is no longer possible undisturbed with 65 dB (comparison Mi Robot: 68 dB). After all, one can vary here. For comparison: We humans talk at an average volume of 60 dB. 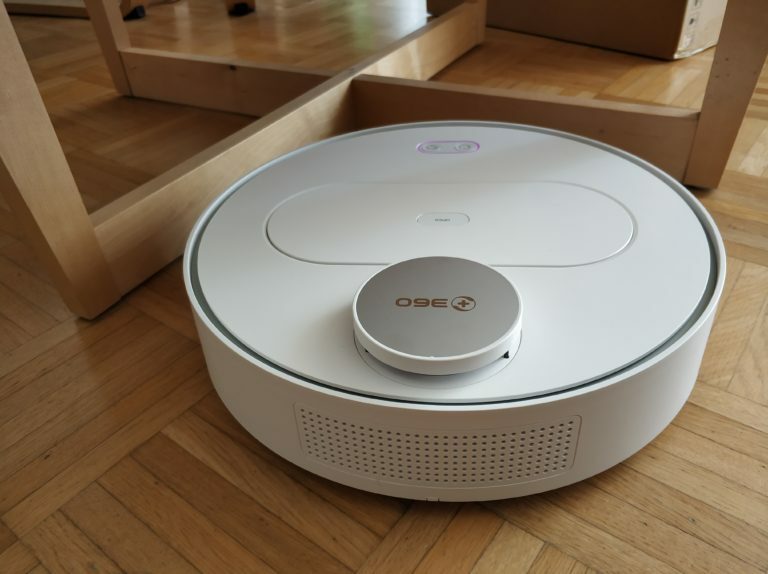 With a vacuum power of 1800 pa, the 360 Sweeping Robot achieves the same result on the scoreboards as the Mi Robot, making it very absorbent and suitable for carpets. This is also supported by the carpet detection, whereby the 360 adjusts the suction power to 1500 pa and “thorough cleaning”. The vacuum robot also performs well on carpets. It detects carpets within a few seconds – but not early enough to avoid them with the attached wiping function. Fortunately, there is the room division so that the vacuum cleaner can be pre-set where it should not drive with the mop attached. The S6 with its large tyres overcomes obstacles up to a height of 1.5 cm. The 360 Vacuum Robot overcomes obstacles of up to 1.5 cm in height and can climb gradients of up to 15° – provided these gradients are evenly steep and are not recognized as obstacles by the robot. Door thresholds are therefore normally no problem, otherwise you have to buy a small ramp for the vacuum robot or build it yourself. From a height of 2 cm the overcoming of obstacles is definitely over. 1. fill the water tank with water. 2. snap the water tank into place on the underside. 3. the vacuum robot is now ready for use. 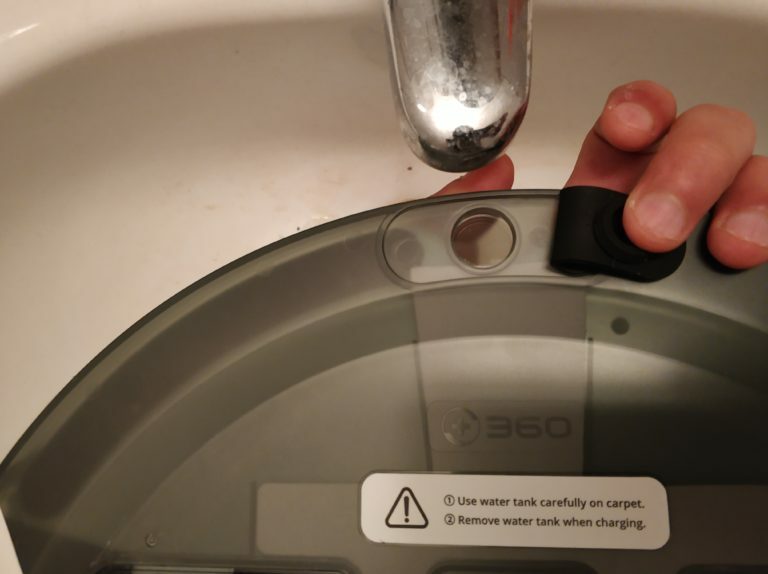 The water tank is a little too small to wipe larger areas well. But: The S6 succeeds in putting some pressure on the mop and thus reinforcing the wiping. Comparable to what a person can do with muscle power, only of course much weaker. 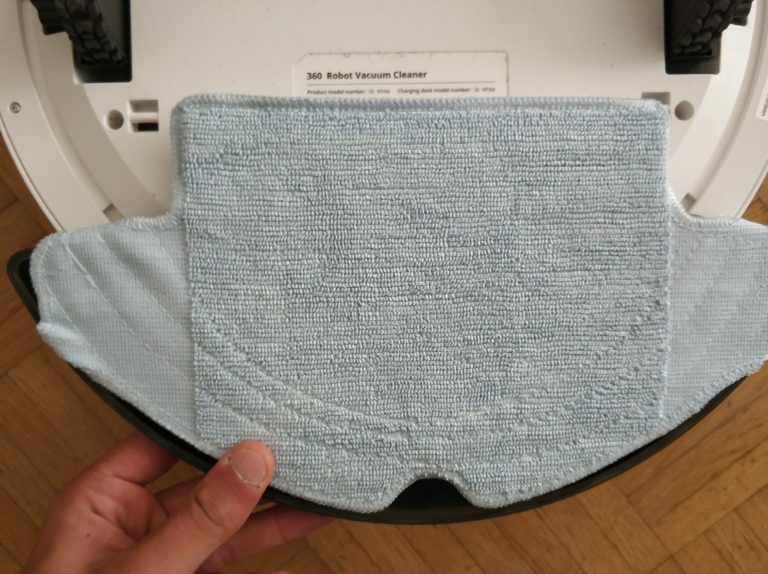 The wiping function is sufficient to relieve household work, but does not completely replace manual wiping. 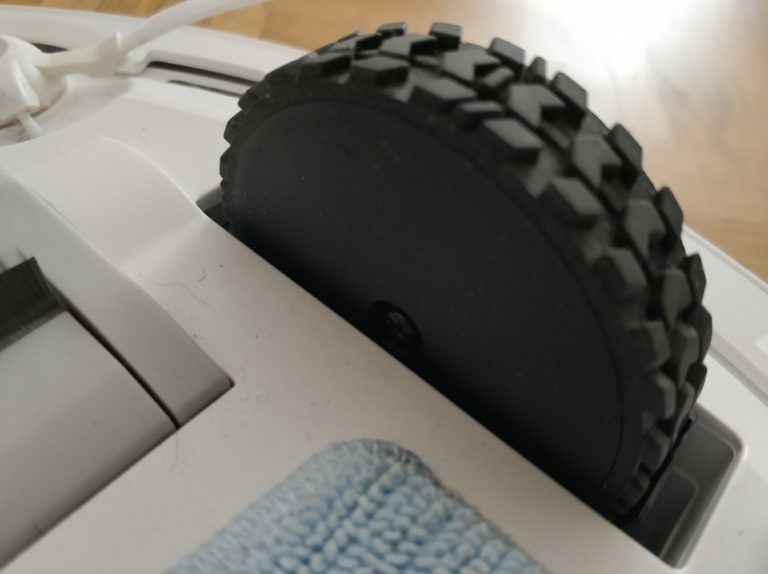 The wiping function is a real relief for combating everyday household dirt, but vacuum robots are not yet ready to completely replace the wiping mop. Not even the 360 S6. 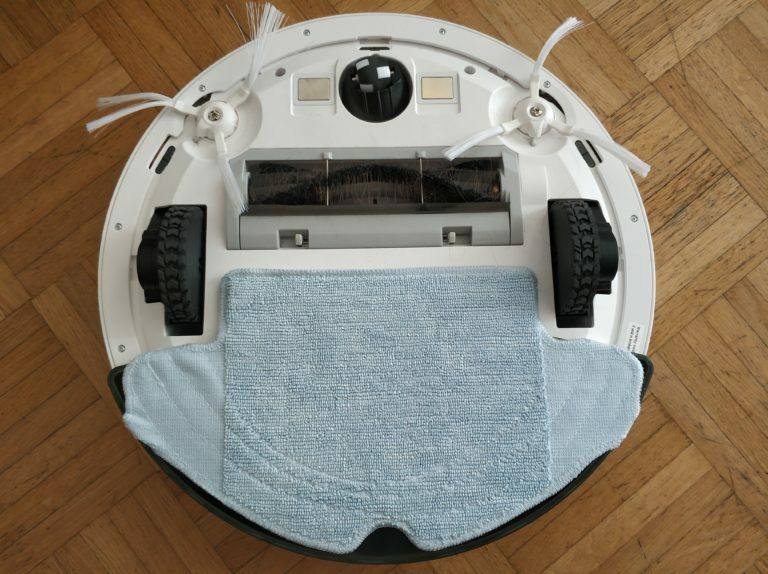 But if you are looking for a vacuum robot with a wiping function, you have a model that doesn’t form puddles, doesn’t let too little water on the floor and actually gets the floor cleaner. With the name “360”, it’s quite possible that you copied something from Dyson. 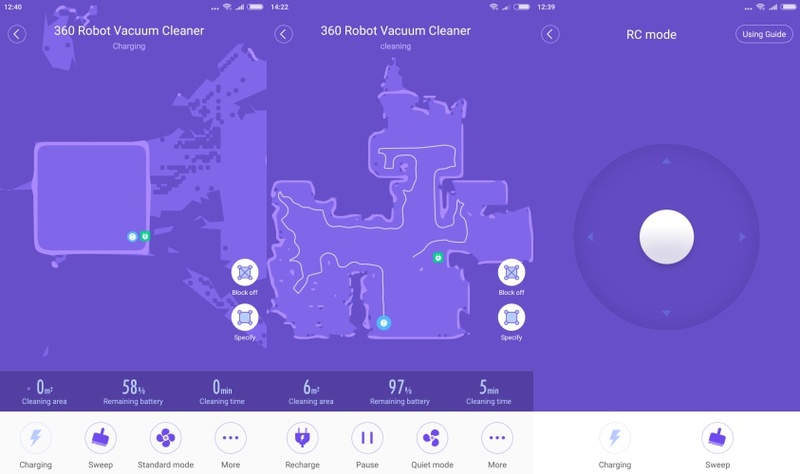 In the same way, the app interface and design of the vacuum robot have certainly been copied from Xiaomi. But: It has been implemented even better in many parts. 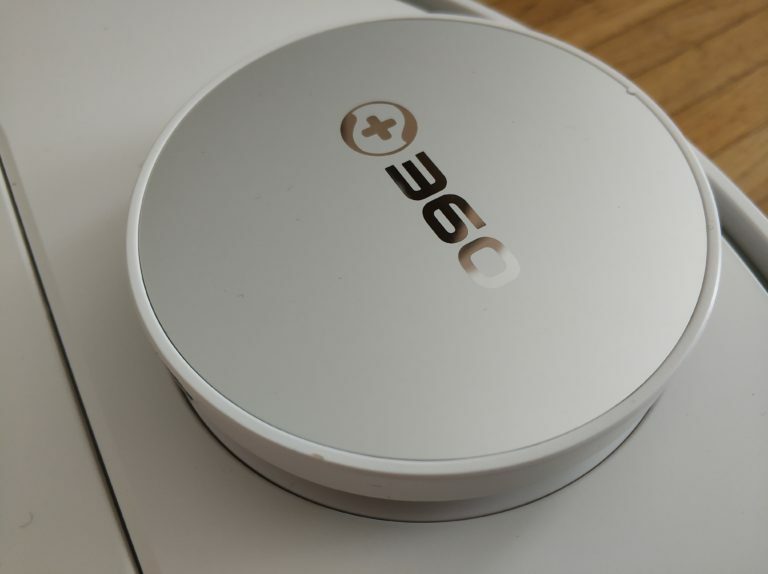 The 360 S6 also does the few points that interfere with the Xiaomi models right. In terms of price it is even below the RoboRock Sweep One and belongs to the more expensive models from China. On the other hand, the vacuum robot also offers the currently maximum possible amount of features (except Alexa control). Especially the update policy of 360 Mobiles will be exciting to follow, also whether the manufacturer will follow other household robots. If, as a vacuum robot tester, you have to think long and hard to name negative points on a model, you know that you are dealing with a top model. I don’t like to write entirely positive about a model, but in fact the 360 S6 can hardly be cut back except for the small dust chamber and a somewhat annoying registration process in the app. But Xiaomi can catch up with the S6 with one or two good updates, especially the card storage would be a welcome innovation. 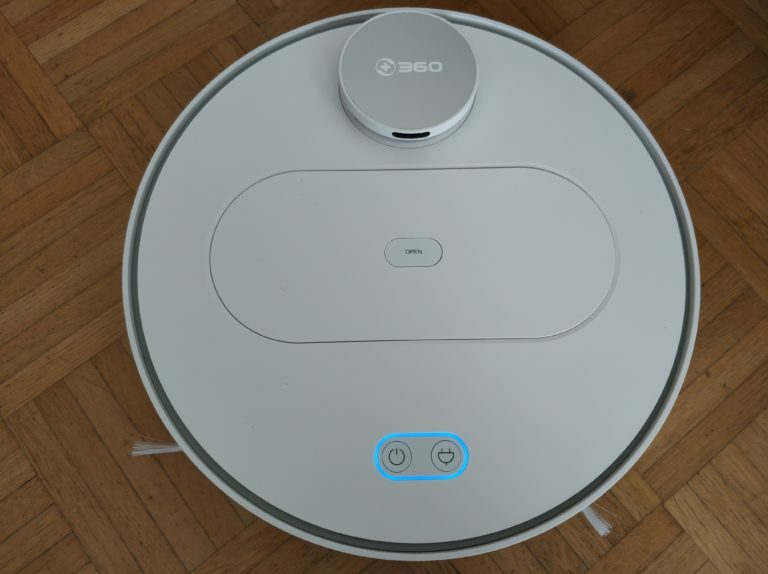 Even if you have to be careful with such statements: 360 Mobiles has currently the best vacuum robot on the market with the S6 Sweeping Robot. So I couldn’t help but buy the robot for my own household. 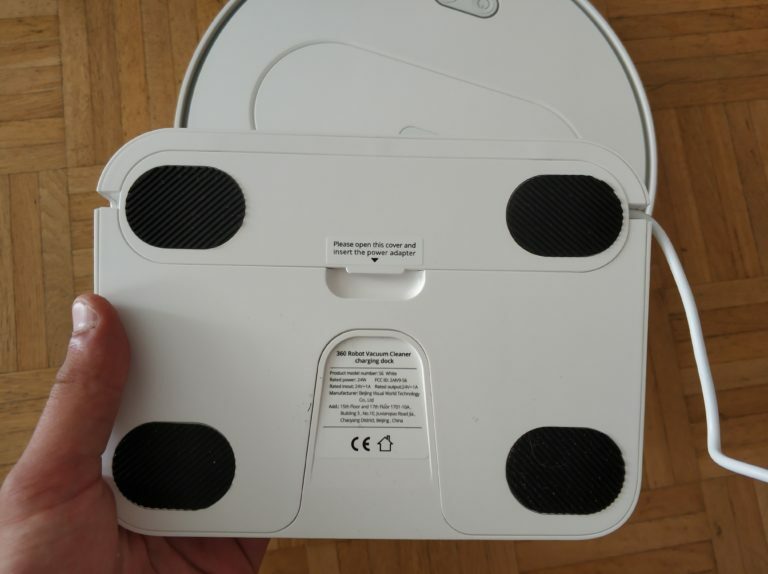 Maybe RoboRock will be able to add with its two new models, maybe ILIFE will get back into the race with the new X800. At this point, however, there is a new king on the vacuum robot throne who now has to convince us in further long-term tests.